No two buildings — or gutter systems — are exactly alike. Whether it’s a shopping mall or country club, a large estate or a neighborhood home, every guttering project has specific needs. And though 5- and 6-inch gutters are industry standards, factors ranging from architecture to geography can affect decisions about proper sizing. Since gutters exist to drain water away from buildings, then estimating the amount of water a gutter must potentially carry is a key to determining the correct size for the trough. In addition to the size of the roof, “Slope is another important factor to consider.” His own rule of thumb is 6-inch gutters for most commercial projects and 5-inch for most residential jobs. 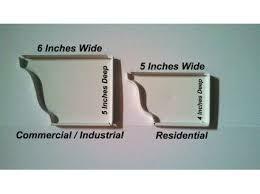 Yet different conditions may require an adjustment in gutter size. Some Fascia boards my not be able to support a larger gutter system. IF YOU HEAR ANY OF THESE PITCHES YOU MAY WANT TO QUESTION THE CONTRACTORS MOTIVES. WITH NO NEED FOR COVERS. WATER THAN 5-K STYLE GUTTER. EXPECTATIONS FOR THE AREA YOU LIVE.